In 1859, Dubliners strolling along country roads witnessed something new emerging from the green fields. The Victorian house had arrived: wide red brick structures stood back behind manicured front lawns. Over the next forty years, an estimated 35,000 of these homes were constructed in the fields surrounding the city. The most elaborate were built for Dublin’s upper middle classes, distinguished by their granite staircases and decorative entrances. Today, they are some of the Irish capital’s most highly valued structures, and are protected under strict conservation laws. 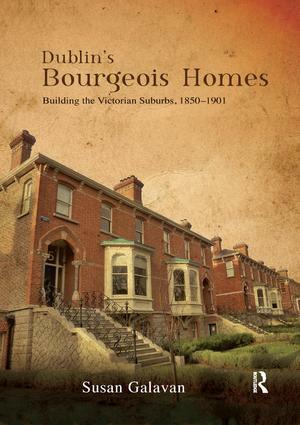 Dublin’s Bourgeois Homes is the first in-depth analysis of the city’s upper middle-class houses. Focusing on the work of three entrepreneurial developers, Susan Galavan follows in their footsteps as they speculated in house building: signing leases, acquiring plots and sourcing bricks and mortar. She analyses a select range of homes in three different districts: Ballsbridge, Rathgar and Kingstown (now Dun Laoghaire), exploring their architectural characteristics: from external form to plan type, and detailing of materials. Using measured surveys, photographs, and contemporary drawings and maps, she shows how house design evolved over time, as bay windows pushed through façades and new lines of coloured brick were introduced. Taking the reader behind the façades into the interiors, she shows how domestic space reflected the lifestyle and aspirations of the Victorian middle classes. This analysis of the planning, design and execution of Dublin’s bourgeois homes is an original contribution to the history of an important city in the British Empire. "Galavan’s presentation of histories is mediated through portraits and other illustrations… The familiar becomes extraordinary. Descriptions of materials and stone-quarrying, along with readings of brilliant masters and doctoral research give the reader access to highly specialised knowledge." "Aside from the architectural evolution that Galavan traces, there is an interesting analysis of how domestic space reflected the lifestyle and aspirations of Dublin’s Victorian Upper-Middle classes. She demonstrates how the internal layout articulates the relationship between master and servant, male and female, adult and child." "[…] Susan Galavan’s book represents an immensely welcome restitution of a traditional strand in construction history. It also has a new ingredient. Since she is an architect as well as a historian she takes a particular interest in the planning of suburban houses and she illustrates her arguments with plans and drawings of the kind which only the Survey of London can match […] .for anyone interested in the Victorian building world, whether they have been to Dublin or not, this is an admirably rounded account of processes which are all too easily overlooked." Susan Galavan is a qualified architect and holds a first class Masters degree from University College Dublin and a PhD in architectural history from Trinity College Dublin. Her doctorate was a multidisciplinary examination of Dublin’s Victorian domestic architecture, funded by a three-year scholarship from the Irish Research Council. She is currently a Postdoctoral Research Fellow at the Department of Architecture, University of Leuven, Belgium.